Orange hawkweed presents a major threat to primary production and biodiversity across south eastern Australia. It is estimated losses to the Australian grazing industries would be in the order of $48 million pa if this weed were allowed to occupy its potential range. Currently in New South Wales, orange hawkweed impacts on the environment and is only located in Kosciusko National Park. However if its spread is not contained, it has the potential to impact greatly on primary production as well as native vegetation. There may also be additional unknown infestations outside of Kosciusko National Park as orange hawkweed was used as a horticultural plant in New South Wales (see NSW WeedWise for information about hawkweeds). 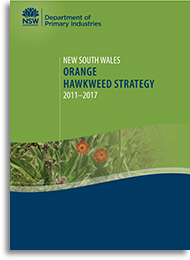 The NSW Orange Hawkweed Strategy has been developed in consultation with a range of stakeholders to address the above threats and aims at eradication of orange hawkweed from New South Wales and as such to prevent the spread of the weed. There is an urgent need to prevent further incursions of this weed by controlling and monitoring existing infestations, scouting for additional incursions within the search area and providing information about the weed to those in susceptible areas.